After a trip to the Detroit Science Center this past weekend, Jacki and I grabbed lunch at Seva, a vegan/vegetarian spot in Midtown, Detroit. Seva has been the top vegan restaurant in Ann Arbor, first opening in 1973, but has been a resident of Detroit for about 4 years. Seva showcases typical dishes that would normally include meat, only they put a vegan/vegetarian spin on them (think Reuben or Mushroom French Dip). Located in the back of the N’Namdi Center for Contemporary Art, Seva has indoor/outdoor seating and a bar area. Check it. Northville Brewery & Winery Scary Spice Hard Cider: Seasonal cinnamon and nutmeg spiced hard cider. Since I was a huge Spice Girls fan as a girl, I couldn’t pass this up (Don’t judge, you know you were, too)! Crisp, light, sour, with a touch of spice. I was hesitant because I thought the cinnamon would be too much, but it was subtle. Yam Fries: With spicy mayo and BBQ sauce. The fries were slightly sweet, crispy on the outside, and tender on the inside. The spicy mayo was my favorite of the two condiments adding just enough bite to the fries. General Tso’s Cauliflower: Light tempura batter, sesame seeds, green onions, sweet & sour chili sauce. Since General Tso Chicken is a favorite of mine, I had to order this. The cauliflower was so satisfying and I hardly missed the meat. The sauce was delicious, sweet, and the tempura batter was light and didn’t take away from the cauliflower. 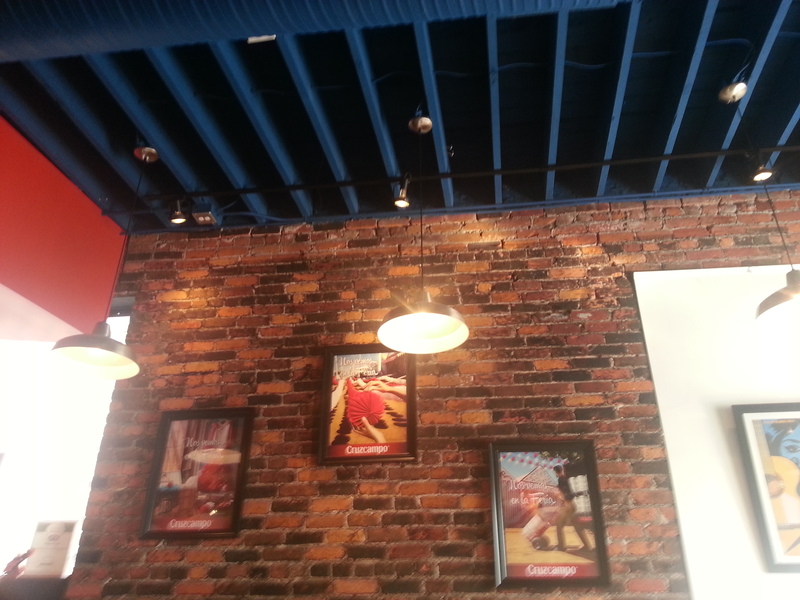 The inside dining room consisted of exposed brick (which I love) high, wooden ceilings and delicate string lighting. The bar area was separate from the dining room and had an inviting lightness to it. Seva uses fresh, seasonal ingredients that will make you forget all about the meat. 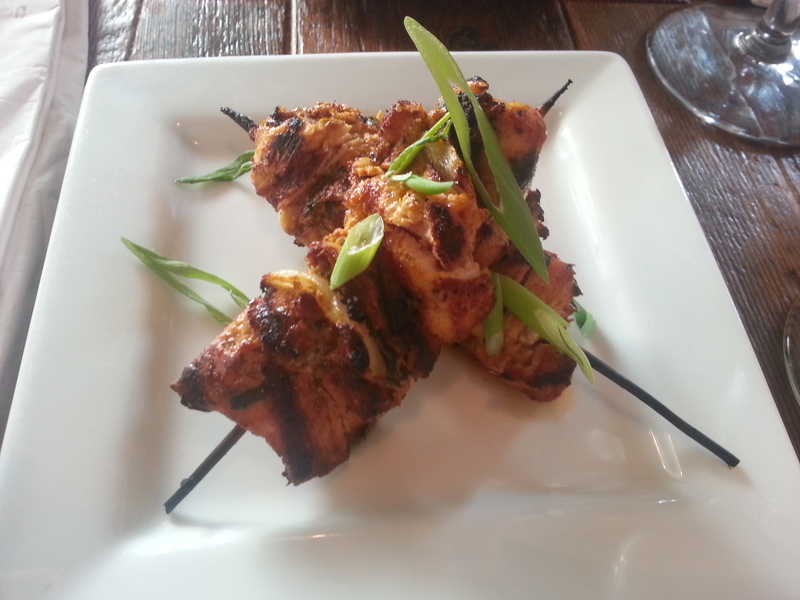 Seva offers Gluten Free items, weekly drink /food specials, and a happy hour menu with half priced appetizers and drinks. 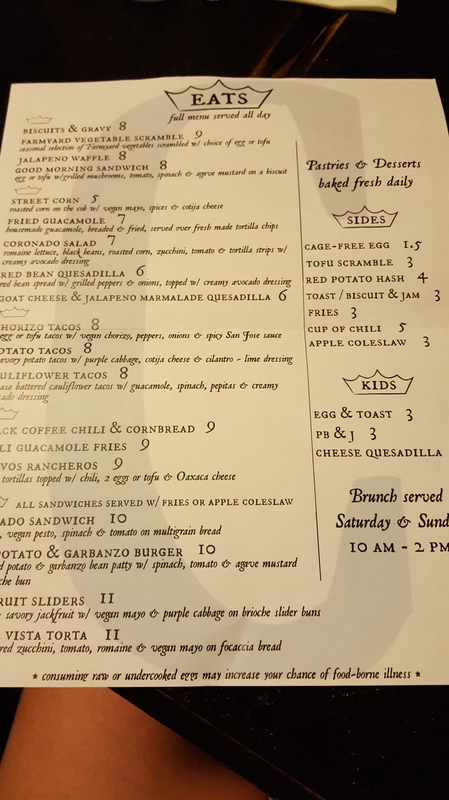 Next time, I want to swing by and check out their brunch menu. Mimosa’s, here I come! 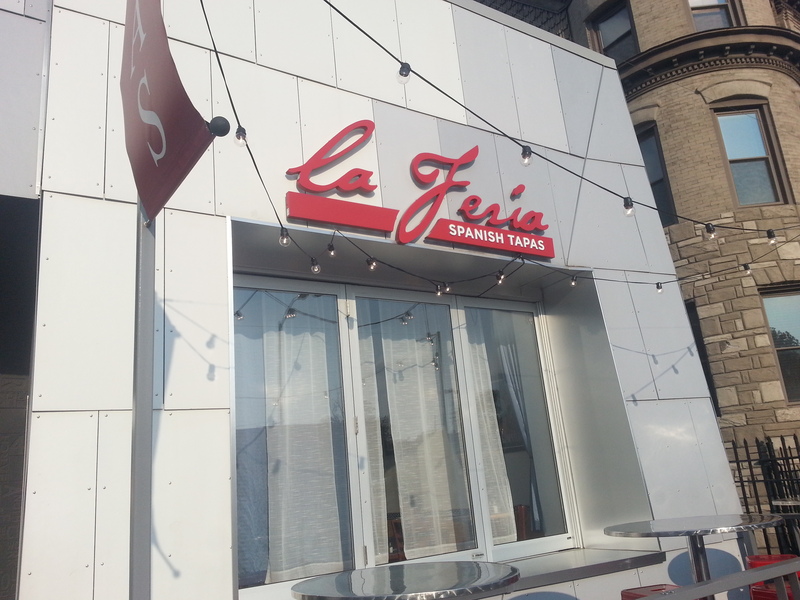 Located on Cass Ave, in Midtown Detroit, La Feria was born in 2012 when three friends decided to bring their joyous experience of the Seville Fair (a week long celebration in Spain) to Detroit. They submitted their idea to the Hatch Detroit contest and won $50,000 to start their business. La Feria Spanish Tapas soon became one of the few restaurants of it’s kind in the area. 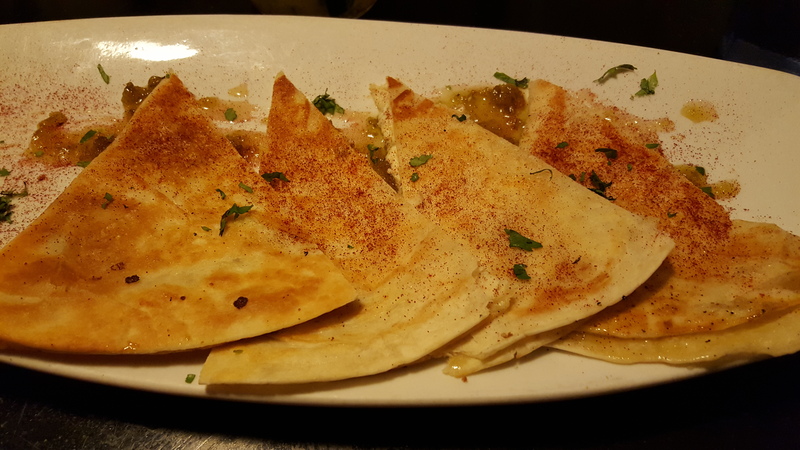 Popular for serving small plates perfect for sampling and sharing, La Feria, offers authentic dishes. My former co-worker, April and I stopped in for dinner and drinks. See how they ranked. Our server recommended the Sangria. We didn’t want to be rude, so we tried it. Sweet, fresh, fruity, with a bold red wine flavor. This Sangria was dangerous because it was so tasty. April and I could’ve easily finished another pitcher. 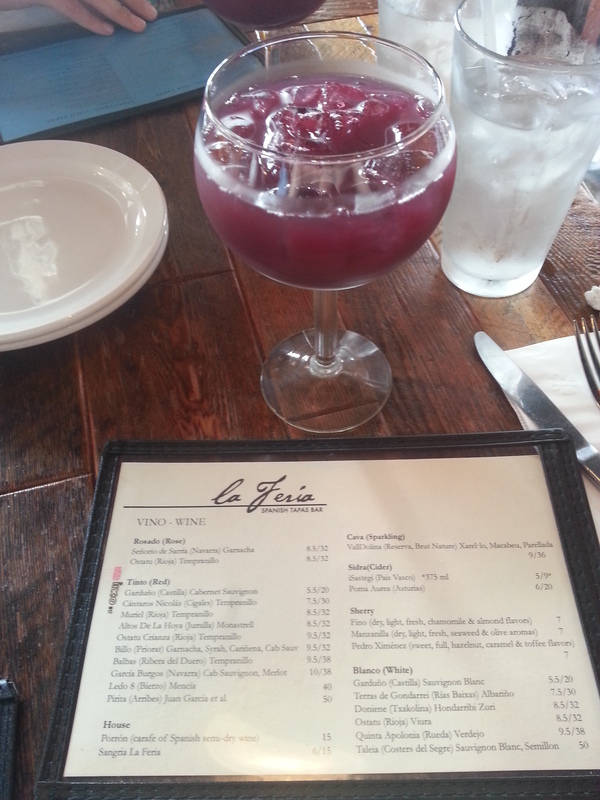 One of the best Sangria’s I have ever had. I really appreciated the fresh fruit. Tostada De Almogrote: Cured Goat & Sheep Cheese Spread. Baguette. The baguette was grilled and toasty, but still had a chew. 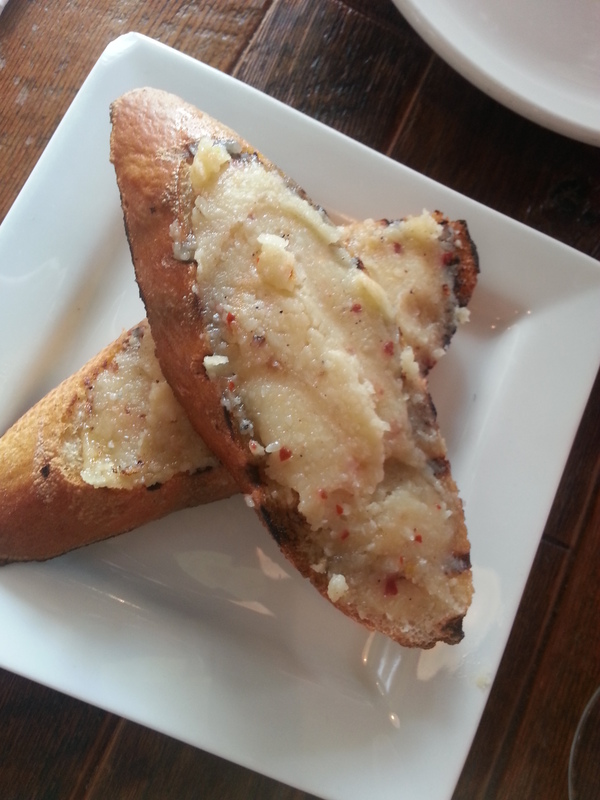 The cheese was creamy and nutty. Perfect starter! 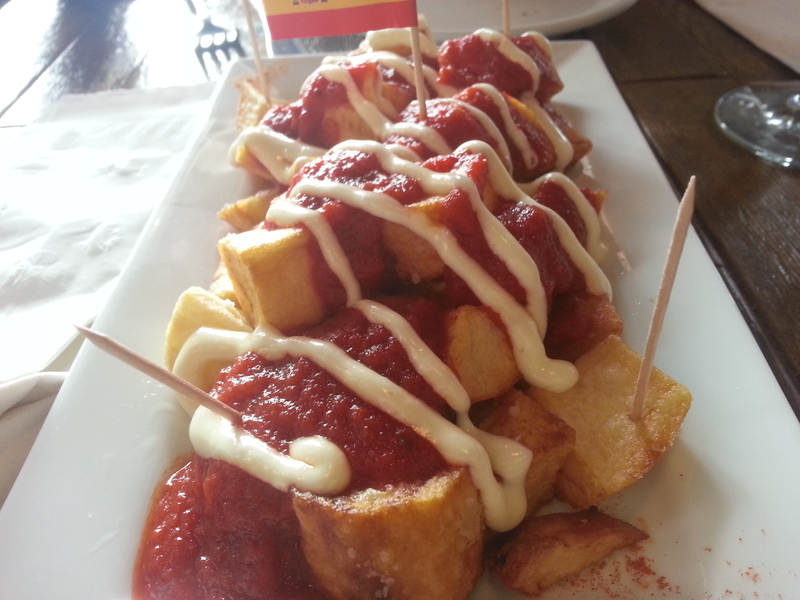 Patatas Bravas: Fried Potato. Spicy Tomato Salsa. Aioli. One of my favorites! The potatoes were crispy on the outside and soft on the inside. The tomato salsa had the consistency of a marinara sauce and had a nice flavor with a hint of spice. We should’ve ordered two! 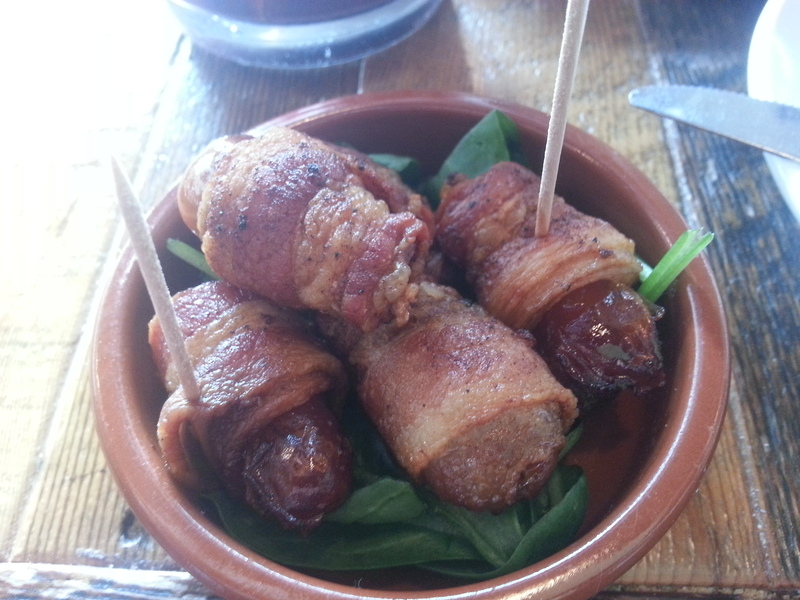 Tocino Relleno De Datil: Bacon Wrapped Dates. Stuffed with Almond. The best! I want to recreate these at my next gathering, but I afraid I won’t do them justice. The bacon was that perfect balance of chewy and crispy and added a nice saltiness to the sweet date. The texture of the almond was delicious. You must try this! Chorizo: Grilled Pork-Spanish Paprika-Wine Sausage. The sausage had a good flavor, but was just a little too charred for our taste. 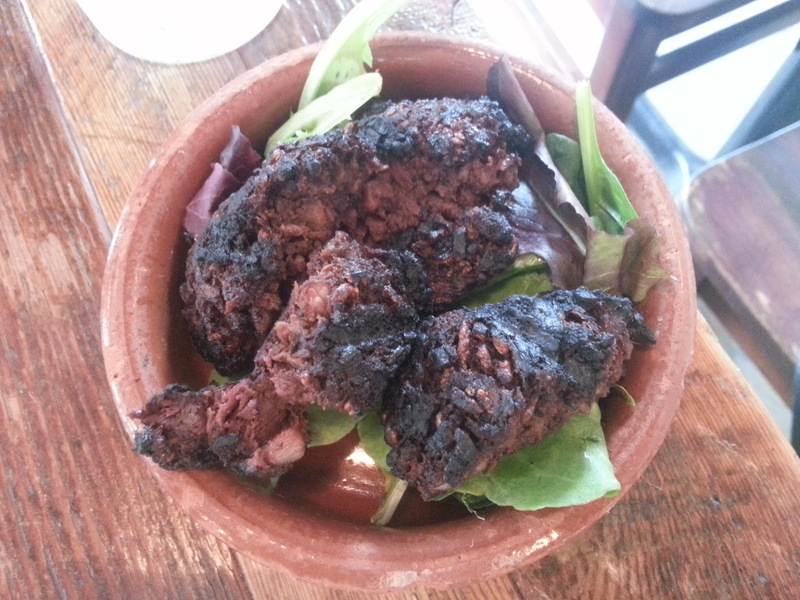 When we asked the server about it, she said it was intended to be charred, but it was dry and not appealing. So we asked for something else. Our server brought us the Chicken Skewers instead of the sausage. They were grilled with nice grilled marks and still moist. 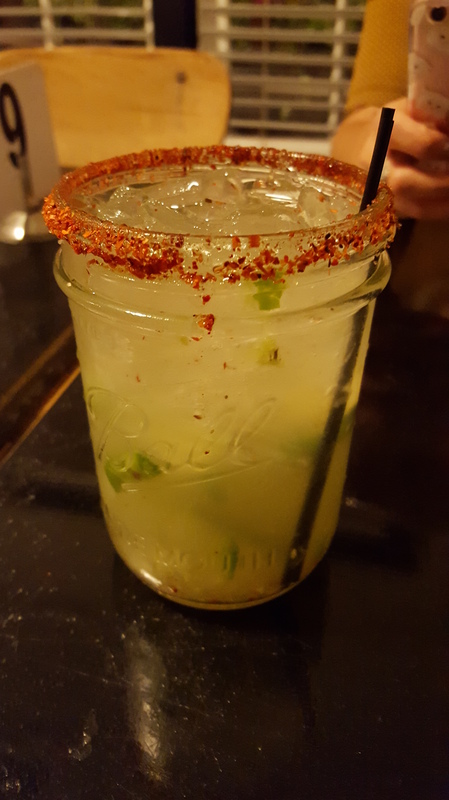 Not spicy, but flavorful. 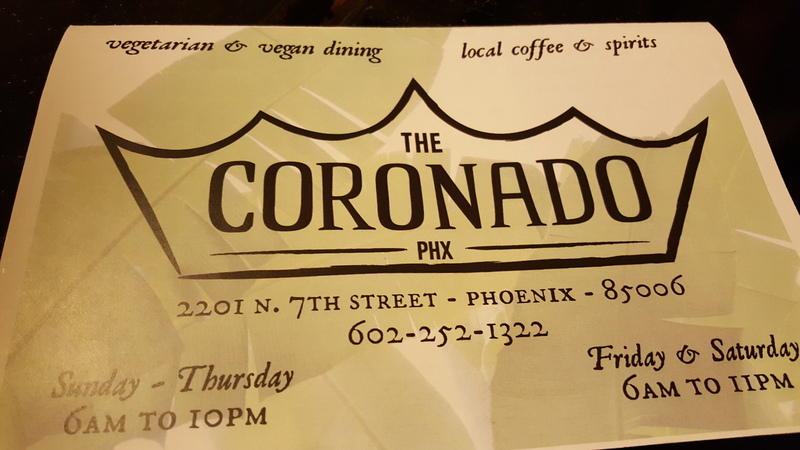 Service was good and we really enjoyed the tapas selections. 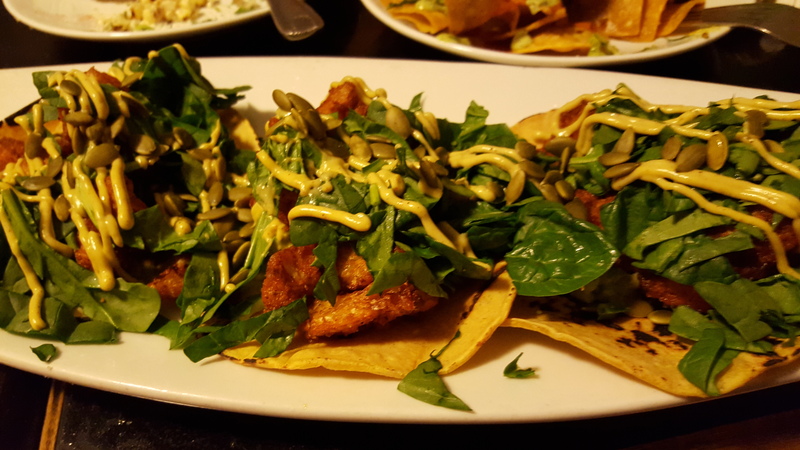 Our server was really knowledgeable and made recommendations based on what our likes were. It was nice sharing and trying different things. Everything we tried was really delicious and fresh (aside from the sausage). 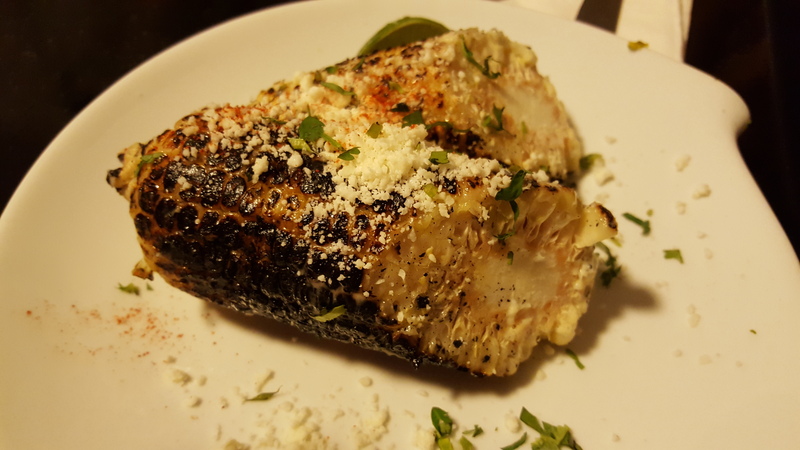 You can really taste the passion and love the chef and owners put into every recipe. 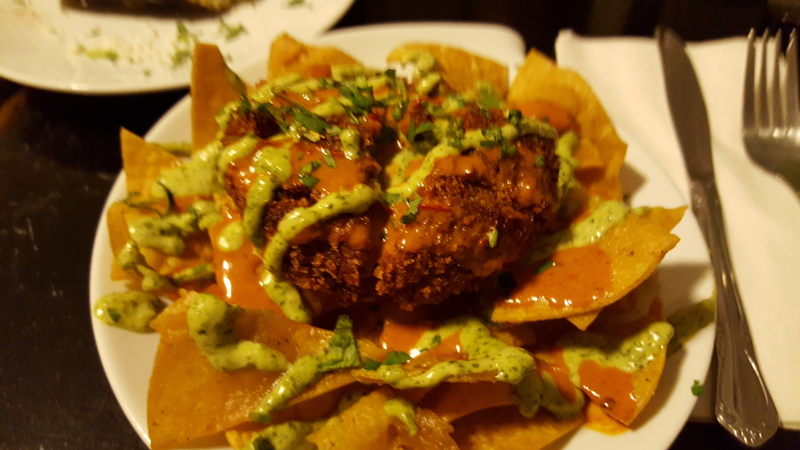 La Feria offers plenty of vegetarian, vegan, and gluten free items so there’s something for everyone. La Feria is really cute inside with exposed brick, paintings, and vibrant red walls that displays Spain’s culture. 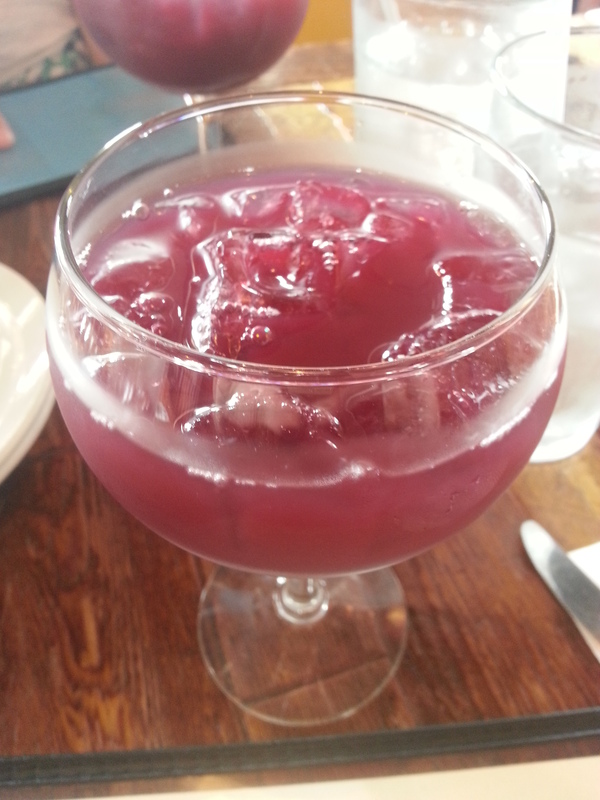 I can’t wait to enjoy Sangria and small bites as soon as it’s patio season! To our next date, April!